Dale Schnettler, the drummer from Prime Circle has acquired a set of Audix Microphones for his drum kit from DWR Distribution. Schnettler has been a musician since 16, he was originally a guitarist but was prompted by his late father to switch to drums. “I learned the basics and never looked back, I was now a drummer,” and being a drummer for this long means he has valuable wisdom to share. “I was in a band that played corporate shows for many years and from the beginning, I knew the value of investing in your musical equipment,” he said when asked about the importance of gear. “Maybe when you start out you can’t afford the best of the best for everything but invest in something, it’s the only way to move up and gain professionalism.” These words don’t come from the drummer of one of South Africa’s biggest bands, they come from Schnettler a dedicated musician who has started at the bottom and worked his way up into playing for one of South Africa’s biggest band. There is no arrogance or detachedness just passion, knowledge and an eagerness to share it. 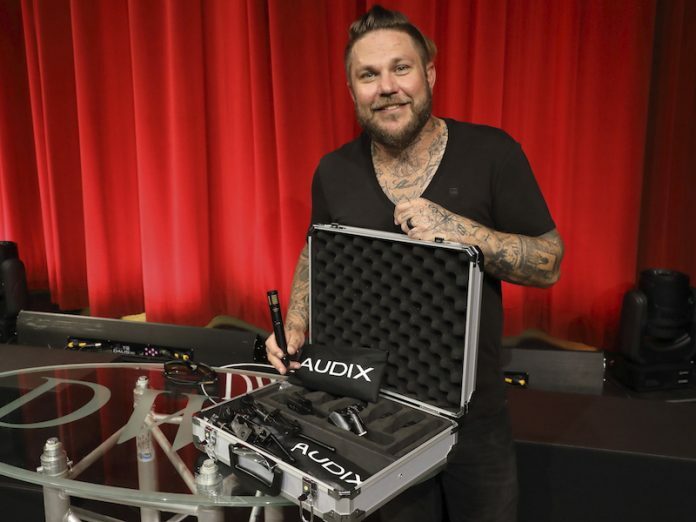 The set he picked up was a mix of dynamic and condenser mics specifically designed for drums. The D2, D4, D6, and the i5 are all designed to pick up the drums they’re assigned to in a dynamic manner to reduce excess noise and maximize clarity, included in his pack were ADX51 condenser overhead mics to capture his hi-hats.